The line showed no signs of moving, so Kevin, Morgan, Tim and I piled our carry-ons into a series of makeshift pillows and made ourselves comfortable on the floor. Mom was too tired to yell at us. My Dad lingered and paced on his cell phone. Irked that we were dead last in line to get rebooked, he’d decided to call the Star Alliance Premier customer service line and make arrangements himself. A pricey international call, but he’s all about beating the system. The middle-aged man in front of us (second to last in line) tried to lighten the situation. He seemed intrigued by our family. “Your dad, he doesn’t talk much, no?” The man said with a chuckle. Ha, if only that were the case. The five of us answer with a series of our usual “Oh, he’s just tired, haha” defenses. “Well you’re a quarter correct,” I said and tell him of our grandfather’s Swedish roots. “But why did you think we were Scandinavian?” I pressed for details so I could accentuate whatever characteristics made foreigners think I’m European. “Well,” he said, “I read a statistic somewhere that 75% of Americans are fat, and you are not. And you all have blonde hair.” He paused. “Except perhaps you,” he said, pointing at my dark hair. “Where did you come from? The same place as Mr. Angry over there?” nodding in the direction of my brown-haired father. My dream of being mistaken for Elin Nordgren lasted all of 8 seconds. On the brighter side, chin up America, it’s actually closer to 70% of us who are overweight, not 75%. “Well,” he began, very clearly excited to share it, “Times were very difficult in Soviet Union, and there used to be very long lines to get bread rations. The line was very very long, so a man said to his friends in line, ‘These lines are too long, we are all here starving. I am going to shoot and kill Lenin.’ The man leaves his fellow men in line. Murat looked at us as if expecting us to finish the joke. Once our silence confirmed we had no clue where he was going with it, he continued. “Ok! Not long after, he returns back to the bread line with his friends. ‘So, did you kill Lenin? What happened?’ they asked him. The man says, ‘I went to shoot Lenin, but the line to shoot him was even longer!” He chuckled at his own punch line and we joined in. Considering we had experienced the no-fun clause of freezing our butts off in line in Russia, it was pretty funny. Or maybe because we were slap-happy tired. At this point we’d moved past the realm of strangers’ casual exchange and were overdue for a formal introduction. His name was Murat, he was from Turkey, married to a Russian woman and lived outside Moscow. We we told him of our vacation in Russia and of our layover plans in Istanbul and before reaching Prague. We glazed over some of the details that would lead him to thinking we were crazy. My dad was still being antisocial, still off in the distance on the phone. He had been on hold for about 25 minutes. While we were mocking him from afar, I guess we were even because our line had barely moved either. There was another announcement in Russian. Murat translated and told us that the checked luggage had been unpacked from the plane and sent to baggage claim. Another man overheard us speaking English and asked for a translation as well. His name was Assam and was from Nigeria. Assam seemed to be the only other non-Russian or Turk on the flight besides our family. Murat cheerfully repeated the announcement to Assam. It was in all of our interests to stick with Murat. Assam went with Kevin and Tim downstairs to retrieve the luggage. He told us he had been visiting his brother, who just so happened to be the Nigerian Ambassador to Russia and Belarus. No biggie. As they walked back up, bags in tow, another announcement. Another presumably Turkish man in front of Murat turned around to discuss the latest news. We waited for Murat to fill us in. “You can’t be serious.” my Mom deadpanned. She wondered if she’d ever enjoy herself abroad again. I always feel bad for my mom on vacation. Sure, she complains, but 99% of the time it is warranted. 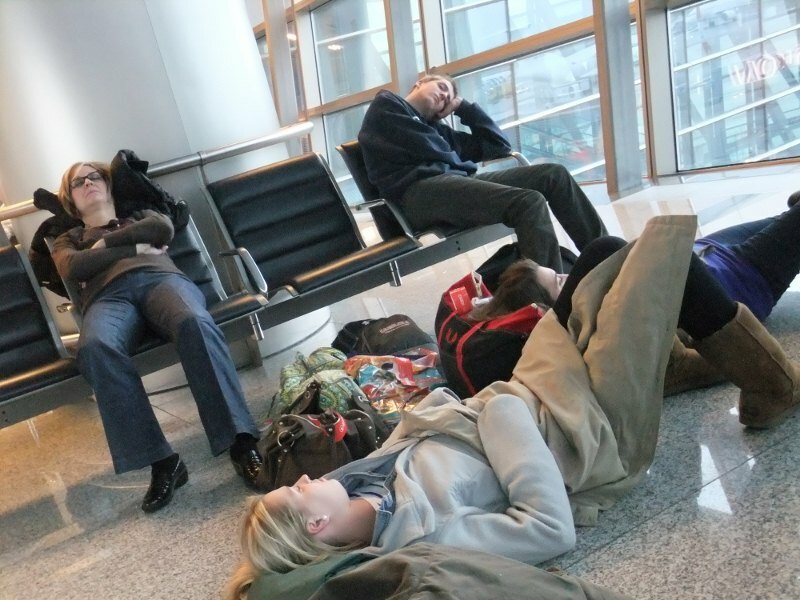 Who wouldn’t complain about being sleep-deprived and relegated to sitting on the floor of a Russian airport? Being stuck in Russia nine additional hours is only slightly better than breaking your foot on a mountain in a third world country, which my mom was only 3 months removed from. Some mothers go on cruises and take their kids to Disney; my mom, who hates the cold, gets stuck in Russia in November. People always tell her that she doesn’t realize how lucky she is, but you try being grateful for anything when your sleep and eating patterns rival those of Guantanamo prisoners. Murat continued to talk to the other man, who I recognized as the kind guy who’d told Morgan and I to go back through the security check when we were searching for our plane. His name was Tarik. “What’s going on?” Dad had walked back over to us in line, finally giving up on his “exclusive” customer service line. Without a proper introduction, Murat told my dad that the plane was now scheduled to leave in nine hours. For most, it is devastating and stressful to find out you are missing your connection and now reach your destination a day late. But for everyone in our family except my dad, at this point, it was difficult to care. Instead we continued our conversation with Assam, Murat and Tarik, which helped us survive the line that had barely moved in an hour. In typical Russian fashion, there was one attendant to rebook the entire flight. This seems to bother no one except us. When we finally reached the agent, she presented with two options. We could take a bus to a hotel several miles away for a few hours or wait at the airport until it was time to take off. We decided it was pointless to go back toward Moscow to do more of what we were already doing–sitting around. In any other situation, my dad would have made us go back into the city to enhance our cultural experience. Turkish Airlines gave us a stipend to eat for the day and were told to report back to the gate in eight hours. “Sweet! A stipend!” It’s a bit sad how free anything excites me when I wasn’t paying for anything in the first place. “How much?” I asked my dad. “Whoopdeedoo.” My mom’s signature one-word commentary always provides sarcastic relief. Manicure plans scratched. A nine-hour delay called for at least two meals. So when we finally got rebooked, certificates in hand, we asked Murat if he had any places he preferred to eat at the airport. “You mean the cow place?” My mom remembered it because so many people recommended it to us when we were out in Moscow the day before. “I guess we will get to go there after all,” she said, feigning excitement. Assam and Tarik seemed down for Mu Mu as well, our party of nine marched up the escalator to Mu Mu. As we looked for a table to toss our massive amount of luggage next to, Murat spoke up. “I’m sorry,” he softened his voice slightly, “would you mind if we joined you? I just think your family is so funny…it might be nice.” I could tell he was kind of scared to ask us. “Of course!” Kevin, ever the friendly and welcoming answered. I’d kind of assumed they would eat with us. At this point, we needed someone else there to keep us from erupting in a angsty, sleep-deprived fight. Strangers at our table was a cheap insurance policy against it. Mu Mu is interesting. Turns out it is owned by an American. Not that anyone in Russia cares. All the dishes have names in keeping with a classic Russian literature theme. Not that I could tell while I was in Russia; I Googled this five minutes before posting this. Murat helped us order from the buffet-style menu in Russian. Since we had been up for five hours, we were eating as if it were lunch, but it was only 8:30 a.m. It was tasty, especially because Morgan and I got dessert. Mom couldn’t yell at us in front of new acquaintances. We enjoyed our meal and learned more about each other. Tarik was a middle-aged lawyer, younger than Murat, Assam and my parents. He traveled to Russia frequently for business and Assam had been visiting his brother the ambassador and was headed back to Nigeria. Murat’s travel plans were less exciting. He was headed back to Turkey because his father had died. The delay had totally derailed his plans, and now he was considering not going at all. Once in Turkey, he had another connection to make to his hometown which is near the Syrian border. Islamic tradition mandates that burial happens immediately, so he’d miss his father’s funeral. He was very calm. I wondered then why he had opted to stay and eat with us. After a while, Tarik went back up to get more food and asked us if we’d like anything. We said no, but he returned with beer for everyone (neither Tarik nor Murat were strict Muslims). Morgan and Tim were not of age, so Kevin and I drank theirs too. We kept talking. And drinking. And talking. As the hours passed, all of us took turns buying rounds. Hey, we needed to max out these free food and (mostly) drink coupons. And we did. It was no surprise that Murat was the talker of the group, and continued to drive the conversation. He enjoyed quizzing us on our family dynamic that led to unfair stereotypes– the baby (Tim, whom Murat affectionately called Junior the entire day), the friendly one (Kevin), the smart goofy one (Morgan) and the psychotic overbearing one (yours truly — not exactly how he framed it but how I interpreted it). “What are you writing?” Murat pointed to my notebook. I’d started writing at 4 a.m., expecting to chronicle the kidnapping of my family by Turkish extremists for ye loyal readers of FF. I told him I liked to write in a journal, especially when we go on vacation. We talked more about our families, religion, politics, our travel, our hopes and even our sadness. Murat grew more emotional as he talked about his family. He was married with two kids; we could infer there were problems. And while Murat said he was very successful businessman, he had a very complicated relationship with his brother. I don’t have the details of the situation, but it involved his brother getting involved in the wrong crowd and Murat bailing his brother out of a very real extortion threat on his life and his children’s. Murat had been financially ruined in the process and after whatever went down, had not talked to his brother in five years. What to do now? The easy answer was what’s the point? He is already missing the funeral and doesn’t have a relationship with his brother. The other answer was to still go, be with his family and try and reconcile the past. It was a lot. We had a tough time complaining about our stupid vacation after that. The conversation turned lighter. Assam interrupted, “I just have…one important question.” His soft-spoken tone made him easy to understand despite a thick Nigerian accent. It was a question that didn’t have an answer, but we vowed to keep in touch. We exchanged emails, phone numbers and took an unusually large amount of pictures together. We even asked a passer-by to take a picture of our entire group. I wondered what he thought of our bizarre cadre. Before we knew it, it was time to catch our flight to Istanbul. We had a lot of empty glasses to clear off our table after eight hours. It was 3 p.m. and I was drunk, but figured Russia’s “You Must Be A Functioning Being In Order To Board” law was more flexible than America’s, if existent at all. We made it to Turkey, gave one last wave and hug to Assam, Tarik and Murat as we went through the customs line. We were instructed by the airline to go to customer service at baggage claim in order to arrange for a hotel, since the Prague flight was long gone. In doing so, we were stuck at Istanbul’s Ataturk Airport in yet another line. By now, we were pros at sitting around and entertaining ourselves. We pitched our tent of suitcases and stretched out on the floor at baggage claim while my dad made arrangements. We took a cab to a hotel near the airport. Morgan and I went up to our own room, threw our suitcases down and went to sleep with our clothes on. It was short-lived. We heard a knock on our door 20 minutes. It was Dad. “Ready to go?” he had his jacket on and everything. “What? Already?” I thought it was the next day and time to catch my flight back to New York. “You’re joking.” I looked at Morgan for back-up but she was still sleeping. “Nope, be downstairs in five minutes.” He shut the door, but turned the light on before he closed it to make sure I stayed awake. We didn’t need five minutes. I still had my jacket and boots on. I woke Morgan up and we met cabs downstairs to take us into Istanbul. It was fine. We walked around, visited some shops, took some pictures of the mosques and went to a “Thanksgiving” dinner (it was the Tuesday before). My Dad had brought a small turkey decoration and placed it on the table among our plates of kebab to formally recognize it as our family “Thanksgiving” dinner. People go away for the holidays to avoid weird families, yet I had failed to escape them mine, and in fact, had volunteered to follow them across an ocean for it. “Get it guys, we have a turkey in Turkey!” I would have been embarrassed, but again, was too tired to care (I have since found this gets me through a lot of my life problems–wearing myself out so much doing something in order to not care about anything). I think the waiters already thought we were weird anyway. I loved Istanbul, and am pretty sure I would have enjoyed it more if I hadn’t been up for 24 hours. When we got back to our hotel it was 2:30 a.m., exactly 24 hours from when we had woken up in Moscow to catch our flight that morning. Even with an exact transcript of our hours-long conversation at Vknovo Airport, it would still fail to sum up the magic of Mu Mu; perhaps this is why I’ve been avoiding writing this for so long. I couldn’t shake this weird feeling for several days. There is something about befriending perfect strangers that stays with you, and it whatever it is, it is something that perhaps doesn’t happen nearly enough. We’ve kept in touch. Murat did indeed travel to Turkey and spend time with his family after his father’s funeral and spoke to his estranged brother. Tarik and I are Facebook friends, and every time we exchange messages he says he is waiting for us in Istanbul. Definitely still need to get back there. But the most surprising follow-up came weeks later in the form of a phone call to my dad in the middle of the night. My mom woke up when my dad’s cell rang. She is a light sleeper anyway, but she always fears a call in the middle of the night is about one of the four of us. It was Assam calling from Nigeria, who was either forgetting or ignoring the time difference between Chicago and Nigeria (7 hours). He said, he just wanted to call and hear my dad’s voice, as it made him recall one of the best days in his life. He hopes that we will think of him as a part of our family. Assam said it was God’s will that our flight was delayed and brought us all together. My Dad agreed. Later Murat and Tarik sent us an email with similar sentiments. After 24 hours of being up, I had a 7:25 a.m. flight (sleeping in) to catch back to New York the next day, while the fam ventured on to Prague with Kevin later in the day. I took a shuttle to the airport, and once there, got myself some Turkish coffee and waited to board. When it was time to get in line, a young good-looking customs agent checked passports as we waited to scan our tickets. “Where are you from, Miss?” he browsed the pages of my worn-out (but mostly water-damaged from getting it too close to water at a beach) passport. I was confused, and thought he was asking me why I was not with them. I was still a little sleepy. “Oh they also live in Chicago, but they are flying back to America later.” I realize this makes no sense –there is no way he would have known I’d traveled with my family this trip. “So you’re not European?” he confirmed. I realized he was asking my family’s origins beyond my American passport. “Oh wait, sorry, yes, well, sort of,” I was flustered. “My grandmother moved to the USA from Italy.” (My nana is my closest tie to Europe, and I wasn’t about to try pulling any Scandinavian cards again any time soon). I was all too excited, my europeanness revalidated. I noted the scarf, boots and jacket I was wearing with a smile. “Very much. It was too short, so I will have to come back again soon.” No need to tell him I only saw a few hours of it. “Lovely. We’ll be waiting for you.” And with that I boarded my flight, quite satisfied with the outcome of a trip I wasn’t even supposed to go on. I made it back to New York. My friend Kelly picked me up (she is way too good to me) and drove me straight to work from JFK. In typical frequent failer fashion, we hit traffic and I was late. Yet I sat down at work with a disproportionate sense of accomplishment. Awesome! What a good memory to keep! One of the best days. ever!! 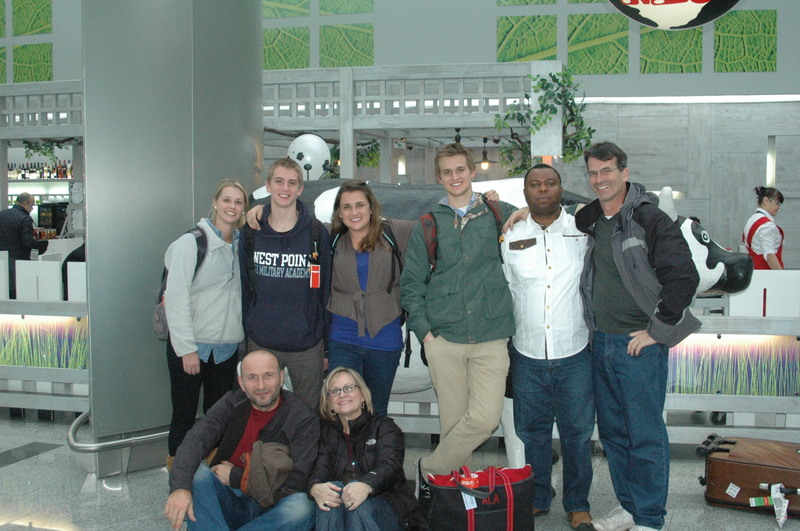 For me meeting foreigners and keeping in touch with them would have been a lifetime travel highlight. I love that! I couldn’t help thinking at the beginning of this blog…”Man why do they keep travelling to these bizarre locations where communication is difficult and problems are inevitable and often seem insurmountable?” Then you befriended the foreigners and made a lifetime impression on one another. That’s why. Reminds me of golf. You could have the crappiest day, hacking the ball all over the place, posting bowling-like scores on your card, then you make that one awesome shot. That one shot that gets you the high-5’s, gives you a story to tell, and gets you to go back one more time. I don’t know if there’s a name for that, but I get it.